This delicious Ambrosia Salad is so easy to make and always a big hit with kids and adults alike! Made in just one bowl, this classic dessert salad is the perfection addition to your next gathering! Love easy dessert salads? Make sure to try this Cherry Fluff, Reese’s Peanut Butter Fluff, or Pina Colada Fluff the next time you’re planning a party. 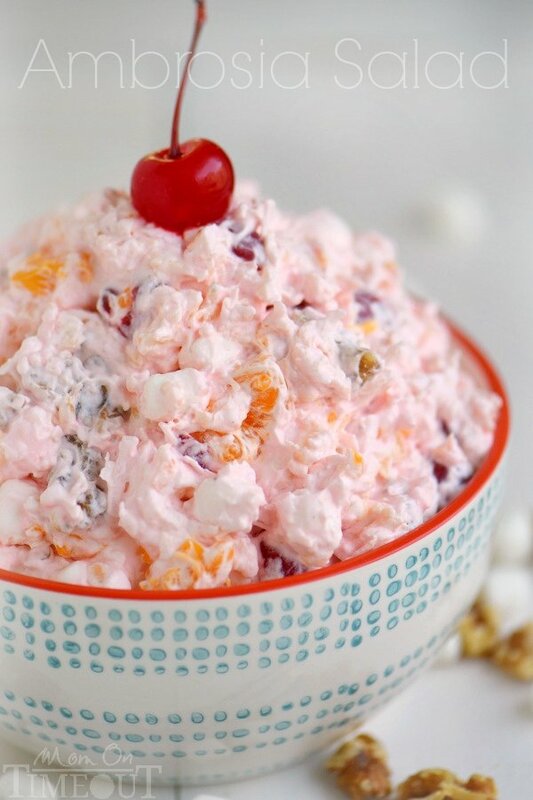 Today I’m sharing an oldie but goodie with y’all – Ambrosia Salad! This easy dessert salad is always a hit and is a favorite of many in my family, especially my Aunt Judie. There is absolutely no reason to pick this up at the deli when making it at home is SO easy. I love this classic salad and I know you will too! I seriously don’t think salads like this can ever go out of style…wanna know why? Because they taste AMAZING! They’re easy, fun and accessible. Kids like them. Adults like them. They’re great for parties, potlucks, barbecues. Have I convinced you yet? 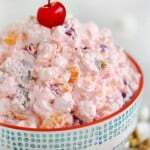 What Is In Ambrosia Salad? So what’s in this classic Ambrosia recipe anyways? A whole bunch of yummy stuff – that’s what! I have always used Cool Whip and sour cream in my Ambrosia recipe but many readers swap out the cool whip and make their ambrosia salad with just the sour cream. The salad will definitely not be as sweet this way or as creamy. Nuts or No Nuts In Ambrosia? Some people like theirs with nuts. Some don’t. I don’t judge either way. Sometimes, if I have the time, I’ll even toast the nuts which adds even more amazing flavor to this easy ambrosia salad. I used white miniature marshmallows in this salad but I’m also a big fan of using the multi-colored fruit flavored marshmallows. Those are always lots of fun and I love the color they add. Totally up to you! There’s a lot going on in this salad and while I don’t technically addy any sugar, all the fruit has a lot of sweetness to it. I have a little secret ingredient for my recipe – sour cream! With all that sweetness going on, the sour cream adds a little creamy tang that helps to offset it. Greek yogurt would also work beautifully. It really helps to keep this ambrosia salad from being overly sweet. Every little bite is pure bliss. Magic I tell you! So if you want to really “wow” your guests, or your family on a Tuesday night (cause it’s just that easy…), give this Ambrosia Salad a try – I think you’ll agree that it really is the BEST. The BEST Fluff Recipes for Holidays, Parties and more! 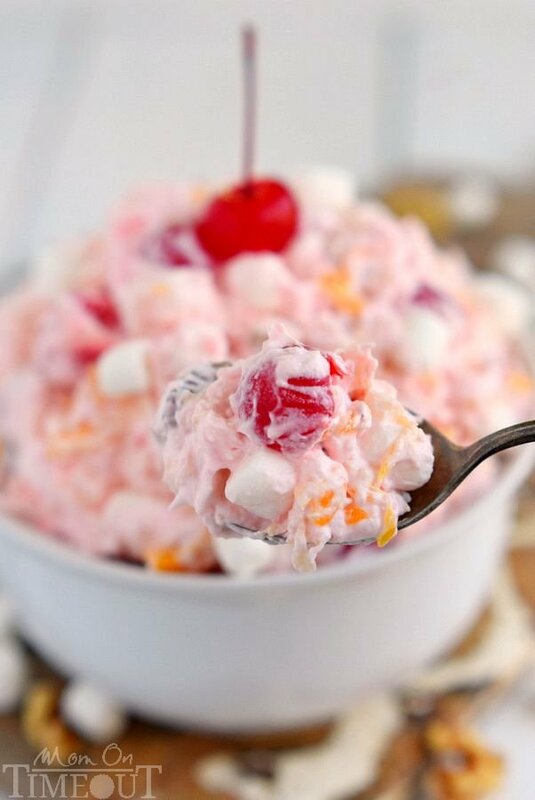 This delicious Ambrosia Salad is so easy to make and always a big hit with kids and adults alike! Made in just one bowl, this classic dessert salad is the perfection addition to your next gathering! Fold sour cream into Cool Whip in a large serving bowl. Fold in remaining ingredients making sure the pineapple, oranges, and cherries have been properly drained. Originally published August 4, 2015. Our local deli makes this same salad and I am pretty sure they use a few drops of almond extract! It is wonderful! A great addition to any holiday meal or get together with family! It really is! So yummy! There was a salad similar to this at the old King’s Table Buffet and I got it every time I went. Their’s had rice as a base and possibly fruit cocktail, along with coconut, mini marshmallows and Cool Whip. I think I’m going to try your recipe and doctor it to come up with a version of their’s (being as I can’t find a recipe anywhere!). i want the recipes now they all look so good , thank you so much for sharing . My Grandma used to make this for Thanksgiving and Christmas. She would freeze it in a bundt cake pan and turn it out to serve with the main meal. It was my favorite! I made this wonderful recipe for Thanksgiving! Our son who is a Master Chef loved it. My husband is hooked on this Ambrosia Since Thanksgiving I have made this at least every week. Thank you so very much for all your amazing recipes. That is AMAZING! So glad you enjoyed it so much! I make this, but I use sliced grapes instead of cherries. I will have to try it!!! I love that idea! Sounds delicious!